Get Your Pedal Assist On! Battery powered electric bikes (E-Bikes) and other low speed plug-in vehicles are now in Vermont - if you’re looking to drive less (or not at all) there are some great options out there. Several excellent resources are listed below to help shed light on E-Bike and other efficient transportation options. Whether you’re located near the upper valley, Montpelier, Brattleboro, Burlington or another part of the state, someone can help you consider your options for pedal assist E-Bike transportation. Resources include organizations that will work with you to design your own E-Bike solution, authorized dealers for popular E-Bike brands, and online resources to stay current on the latest E-Bike and efficient transportation news. There are many more resources available online and in local bike shops - let us know if you you’re aware of other resources we should include! Already have an E-Bike? If so, Efficiency Vermont would love to hear more about your experience for a research project - please take this five minute survey. Watch our 1 minute video for a quick introduction to E-Bikes and then dive in to the resources below for more information. VBike is a nonprofit organization dedicated to shifting the bike and bike culture in Vermont towards an inclusive, fun and transportation-oriented future. VBike's main focus is to promote exciting innovations and solutions, including electric-assist technology and cargo bikes, which profoundly expand the range, carrying capacity (children and cargo), hill climbing ease, comfort and the overall utility of biking. 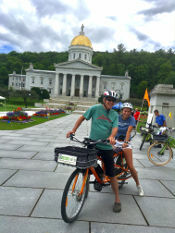 To get Vermont moving on these advances in bike transport, VBike has developed diverse fleet of electric bikes for families, commuters, seniors and others to provide hands-on experiences of these mobility solutions. The fleet, which is unique in the US, has been featured around Vermont for test rides at community events, and workshops. In 2016, VBike piloted its highly successful Take it Home program, providing Brattleboro area residents an opportunity experience their daily errands and trips by taking home one of our electric-assist fleet bikes for a up to a period of a week. The project inspired widespread adoption of e-cargo bikes and e-bikes in the area. VBike is working to expand the Take it Home program statewide in 2017. To make these options more accessible to Vermonters, VBike supported the VSECU credit union in developing Vermont's first low-interest loans for bikes. VBike also works under contract with Go Vermont to provide free bicycle consultations for Vermonters looking to purchase a cargo bike, e-assist system or anything related to bike transport. VBike also provides cost-free support and consultations to the state's bike shops. Local Motion is a Vermont statewide nonprofit advocating for walkable and bikeable communities. They have many resources on their website for cyclists, including their information on their e-bike loaner program which provides free short term loans of several different types of e-bikes. BED offers a $200 discount on an e-bike purchase for existing customers. Go Vermont is a resource from the Vermont Agency of Transportation designed to help Vermonters reduce the cost and environmental impact of driving. They offer free carpool matching and vanpool services, and statewide bus routes, as well as free resources to help you promote more efficient travel options at work or at home. They have a listing of Vermont cargo and E Bike stores on their bicycling page, along with many other great resources. A growing number of local shops offer electric bikes in Vermont. The list below is a resource for e-bike shoppers, but we do not specifically endorse vendors. Electric Bike Report has news, guides, reviews, tips and more on all different brands of E Bikes. There site has many options to choose from when you are looking for any information about a particular bike you may be interested in. A great resource to stay up to date on electric vehicles, Charged covers anything and everything renewable energy, battery technology, clean alternative transport systems, E bikes, EVs on the market and EVs soon to be released. Karl Kemnitzer is an e-cargo bike developer in the upper valley of Vermont. He has been doing custom builds for many years and regularly updates his blog: My Solar Electric Cargo Bike. The blog contains years of various projects working on e-cargo bikes of different designs and guides on how to become a part of the e-cargo bike world. Want something more efficient than a car, but capable of traveling on the highways for longer trips? You might consider an electric motorcycle. There are several exciting options for zero emission motorcycles, including well reviewed models from Zero which are now available at Cyclewise in New Haven, Vermont and other northeast dealerships. Just need to get around campus or town? A neighborhood electric vehicle might fit the bill for you. Under Vermont statute, these are limited to a maximum speed of 25 mph and are street legal on roads with speed limits up to 35 mph. GEM is one of the leading manufacturers, with many different models and configurations available, including one with seating for up to 6 people! Organic Transit is a company that provides a transportation alternative to people who want to save money by not going to the gas station but also want protection from the elements. ELF is an alternative vehicle that rides with the comfort of a car, gives you the exercise that a bike would and gets the equivalent of around 1,300 miles per gallon with a solar panel to help power your electric assist.